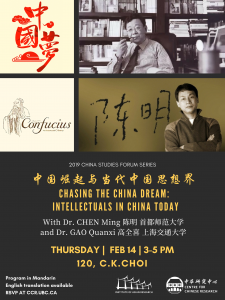 A dialogue with Professor CHEN Ming and Professor GAO Quanxi on China’s rise and its intellectual sphere, where is China’s liberalism up to, and what exactly is new Confucianism. Hosted by Prof. Timothy Cheek. Click here for his bio. Click here for an introduction and translation of his “Transcend Left and Right” by Reading the China Dream Project. Click here for an introduction and translation of his works by Reading the China Dream Project. Program in Mandarin (English translation available).